Jodogahama (浄土ヶ浜) translates to "Pure Land Beach" or "Heaven's Beach," and it's not at all hard to imagine why. This pristine coastline, filled with visually stunning jagged rock formations, will take your breath away. 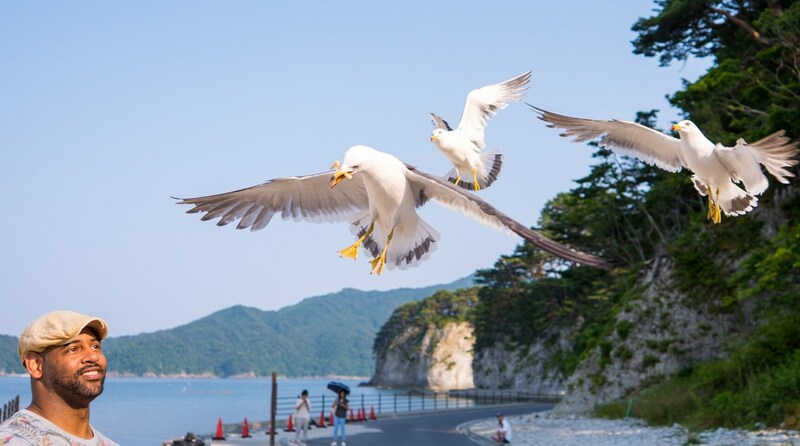 Join Wendell, our Managing Editor, who is stepping away from his desk in Tokyo to see it for himself (and play with seagulls). As the Managing Editor of the English section of AAJ, I sit at a desk in Tokyo looking at gorgeous pictures from all over the country: pictures like this, of Jodogahama, that look heaven on earth. It's times like that when I wonder what would it be like to be there in person. And heaven on Earth is definitely appropriate. One look at Jodogahama and it's easy to see why it's one of Iwate Prefecture's most beautiful scenic areas. Just the contrast of colors alone are enough to mesmerize any traveler: the azure blue waters, emerald green pines and jagged ash grey rocks are all breathtaking, especially in the summertime. We headed out there in late June and the colors were simply astounding. One of my favorite parts of the beach is the wildlife, specifically the brave birds who inhabit the rocks. The seagulls here are very friendly, especially if you feed them! If you have snacks for them, which are available in a nearby shop, they will politely walk near you and wait to see if you're sharing or not. Once you've established you're friendly, then they will open up to you, as long as you have treats. Once your bag is empty, they will give you your space. If you're feeling bold, try feeding them from your hand. It's a lot of fun watching these intelligent birds expertly gauge the distance and speed needed to grab food from your hand without anyone getting hurt. We recommend only feeding the gulls snacks from the shops, as introducing strange foods into any wild animal's diet can be harmful. There are two paths you can take to arrive at the beach. First, you can drive directly to the beach, which is what some tour groups and chartered buses will do. However, another option is heading over to the visitor's center to learn all about the area before exploring. Along the way, you'll have the opportunity to get on a large tour boat and cruise the cerulean waters. The seagulls will keep you company as they wait for snacks. However, once you arrive at the beach proper, there is another option available for further exploration of the beach. You can take a sappa boat, which can only accommodate small groups. These boats actually go inside some of the watery caves to give you a true insider's look at the phenomenal rock structures. Either way, you simply won't be disappointed by the astounding view awaiting for you!